I’m stunned by the awful, heartbreaking news. This evening I received a flurry of texts, BBMs, voicemails and emails, informing me that LPGA player Erica Blasberg has passed away. She was only 25. According to reports, Erica’s body was found Sunday afternoon in her home in Henderson, Nevada. Police spokesman Keith Paul said Monday authorities were investigating the cause of her death. No details have been disclosed and it was not immediately clear whether foul play was involved. In Erica’s only start this year at the Tres Marias Championship in Mexico two weeks ago, she finished tied for 44th. As a standout junior and collegiate golfer, she was a two-time All-American at the University of Arizona before turning pro in 2004. She was also named NCAA Freshman of the Year and Pac-10 Player of the Year in 2003. 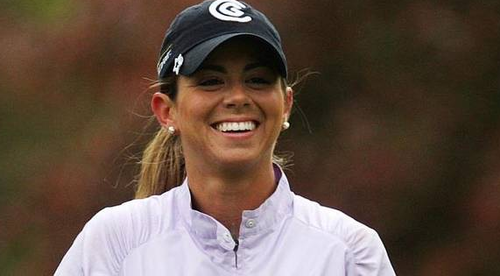 But she struggled in her professional career, only making five cuts in the 2009 season and lost her Tour card. I didn’t know Erica well (or really at all), but I played at a lot of the same tournaments as she in junior golf. We also shared quite a few mutual friends. I last saw her Friday the week of the US Open at Bethpage. In fact, it’s kind of a funny story. I was with Erica’s former caddie, Ray Kim, who remained close with her even after he stopped looping for her in 2008. Ray wanted to meet up Erica, but she got caught trying to sneak in her phone, so we weren’t sure how we would find her. He had said she really wanted to watch Tiger Woods, her favorite player, who she had never seen play before. Usually I avoid the stampede that follows Tiger around, but Ray had never seen him play either, so we caught up with him on the 17th. In between 17 green and 18 tee, we were trying to fight our way to watch him tee off. Then I heard a female voice say to Ray something like, “You here to watch Tiger?” Neither of us can remember exactly what she said, but we both agree it was some cheesy pick-up line. Ray didn’t realize it was Erica at first and she continued to play along like she was trying to hit on him until he looked over and saw it was her. You had to be there, but out of all the places to run into her, she found us near the 18th tee. After the three of us braved the crowd to see Tiger play 18, we wandered over to the practice green, where Tiger showed up a little later. We got front row seats to watch him putt for a bit. Erica was in awe, saying, “I could watch him putt forever.” It was the first and last time she got to watch Tiger play. Paulie Maggiore, caddie for LPGA Tour player Jean Reynolds, also said he saw Erica in Mexico. Fellow golf blogger Shane Bacon was friends with Erica and caddied for her several times. He wrote a nice tribute to her over at Yahoo’s Devil Ball Golf. Erica will be missed. My sincerest condolences to her friends and family.